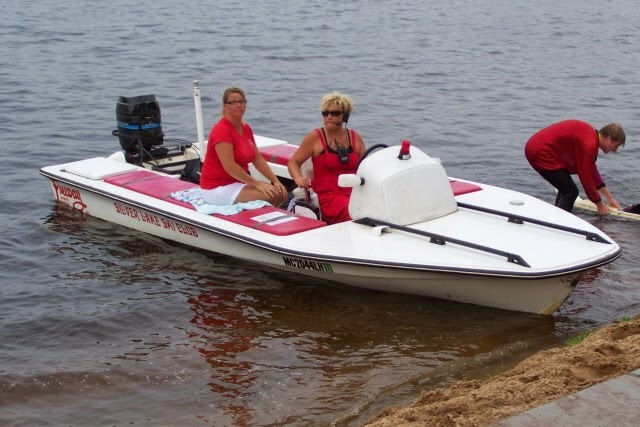 Dyna-Ski Boats: New Dyna-Ski Model? I have been thinking about adding a new model to the Dyna-Ski line up. 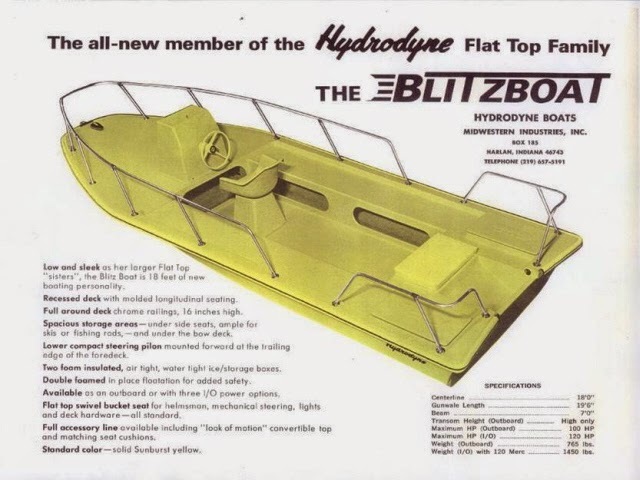 The model would be based on the old 18' model called the Blitz Boat. The old Hydrodyne boat company was way ahead of the rest of the world with some of their product offerings. Sadly most of the molds were buried, destroyed or something and no longer seem to exist. 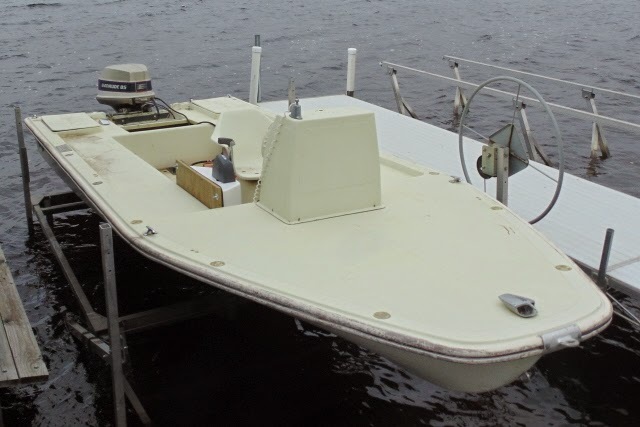 The old Blitz Boat is about the same size as the 17.6 Open Bow and fit nicely on one of my lifts I have for 17.6 Dyna-Ski Boats. I'm partial to the Port-A-Lift brand and I have four that I purchased used over the years of searching CraigList. I somehow got a nice scan of an original brochure for the boat which was a member of the Hydrodyne Flat Top Family. I honestly don't remember where I got the information from. 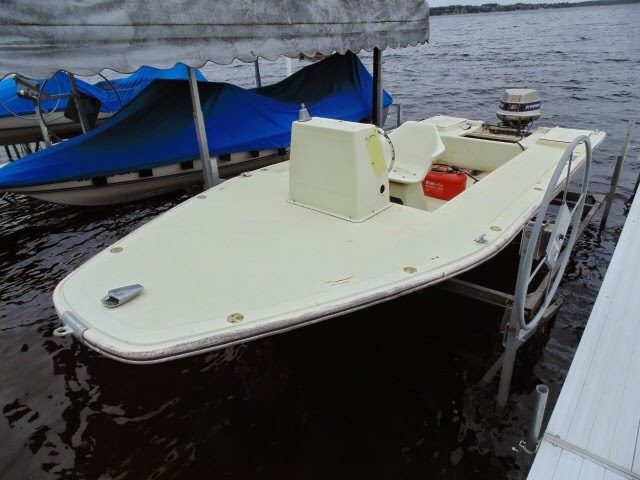 I also have a 24' Hydrodyne Outboard Flat Top that is waiting for a future use and not for sale. Sorry! 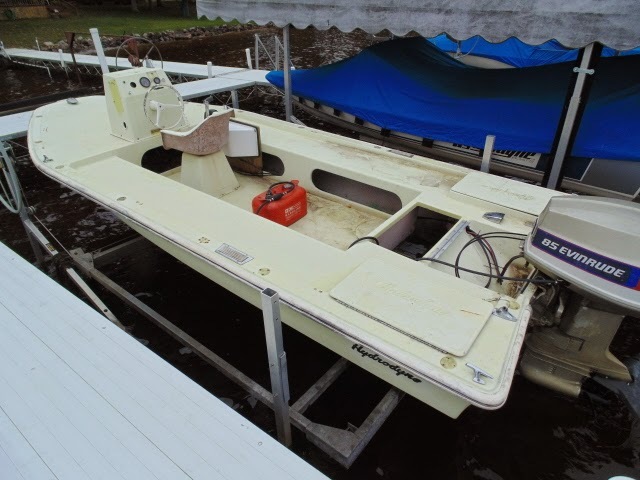 The old Blitz Boat is rated for 100 hp and I had an older good running Evinrude 85 hp available so I replaced the 85 hp Chrysler that came with my purchase found on the internet. I actually sold the old Chrysler engine. We put on new Evinrude controls and rigging using a 6 gallon gas can with the engine which requires oil to be mixed with the gasoline. Unfortunately the motor has no power trim or tilt yet. Transom is OK but not great and the boat seems pretty solid given its age. It is not a light boat by any means. The boat had the side rails like the ones pictured on the brochure which I removed and saved because I did not like them on this boat for my intended use. I have the ski pylon for the boat but removed it for my testing so far. It appears easy to remove and install. The boat has a nice small wake very similar to the Dyna-Ski 17.6 Open Bow. The first Blitz Boat I saw several years ago did not have the railings on it. 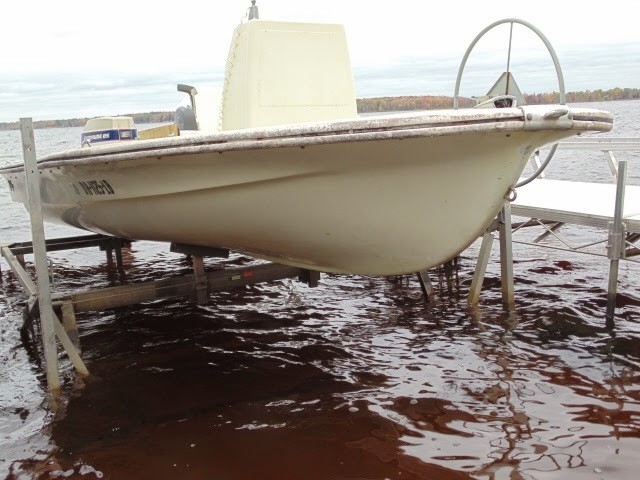 The boat was used as a pickup boat at the Division II Show Ski Nationals by the Silver Lake Ski Team. It won't be cheap to build a new mold and I would most likely use the same hull mold that is used for the 17.6 Open Bow to keep the development cost down. 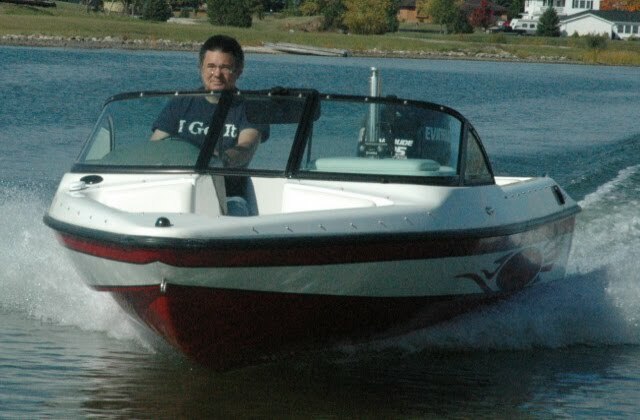 This would make the wake very similar to the excellent small ski wake that the popular 17.6 Open Bow has. So what do you think? Would you buy one? How much should it sell for water ready with a 90 hp motor and a decent trailer?